Many times when body image is brought up, people often tend to think about women. Believe it or not, men also have problems with their appearance. Males have eating disorders, as well as complete body obsession that can take over their life styles. Men also develop different ways to deal with body image than females. However, men still need just as much attention as women do to try to eliminate their struggles with their body disorders. A common, but not well known disorder in men is bigorexia, also known as muscle dysmorphia. Dr. Harrison Pope is a psychologist who defines bigorexia as “sort of a reverse of anorexia nervosa, in which a guy looks in the mirror and thinks he looks too small, when he’s actually big” (Harrison 293). The male is completely dissatisfied with himself because he feels that he is not muscular enough (Leone 353). Women can also suffer from this disorder however it is more common in men. Dr. Harrison Pope said that, “...most people don’t want to look great, they just want to look acceptable" (Leone 353). This dissatisfaction can affect a person's daily life severely. When a man falls victim to the disorder he may show many different indications including: constantly staring in mirrors, going to the gym frequently, ignoring people and social events, and most alarmingly, using steroids (Leone 355). Even in college, guys are constantly pushing themselves harder all the time to go work out daily with routine exercise. But a lot men that have muscle dysmorphia are body builders. 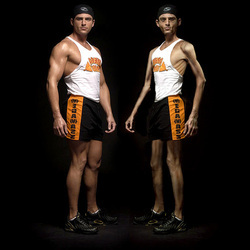 Dr. Harrison Pope said that approximately 10% of all bodybuilders have muscle dysmorphia. Body building can actually be considered a sport where the body builders show off their figures for judges and they are scored on how big they are and also their tone (Mosley 193). Body builders learn a lot of what they do from other body builders, from fitness magazines and websites (Mosley 197). Muscle Dysmorphia is harmful to men and has a large impact on how they feel about their image. A male's self esteem is really just as fragile as a female's. However, men are known to hide it a lot more frequently. The reason for that may be because males express it in a completely different manner (Hendel 175). Women are open about their emotions and therefore they tend to express feelings out loud. This makes women more willing to talk about the way they feel about their body than men. Boys do not often like to express their feelings out loud and are generally not as willing to ask others for help with their own problems. They tend to see it as a feminine thing to do. Instead, they may do other things to get attention, even if it means acting out with bad behaviors (Hendel 176). Women have an easier availability to outlets that help them cope and become more comfortable with the way they are with magazines such as Cosmo and Seventeen. Men do not always have these outlets or they just have too much pride to use them. A good way to resolve and prevent these kinds of problems is keeping them involved in sports or other socializing activities. The every day struggle of anorexia and bulimia with men tends to fly under the radar compared to women. Both men and women suffer physically and emotionally when dealing with these diseases. Sadly what is suppose to be an unbiased source of information, the media, draws more attention to the issue of women suffering with anorexia or bulimia along with many other eating disorders. The macho, tough guy generalization of men may sometimes prevent guys from talking about problems thus creating a lack of interest by the media. Women who are generalized as vulnerable and weak when compared to men, end up in the line light. Although, the issue of men and eating disorders may not be talked about as much as women. Men should not be ruled out when it comes to the everyday struggles they must face. In fact this generalization, portrayed by the media, may cause men to become more inward focused when dealing with problems. The restraint of outward emotions may have an even more drastic effect. In the long run men may develop worse problems than women in which society and the media are more accepting of women with eating disorders. Women seem to have more outlets when confessing their inward issues. Surprisingly, more athletic men go through complications with anorexia or bulimia than non-athletic men. 3% of athletes at 22 different Midwestern colleges in the United States had symptoms of anorexia and 21.5% had symptoms for bulimia (Glover 18). 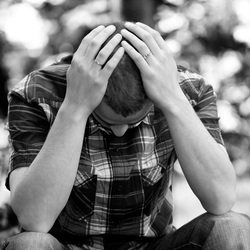 There are tons and tons of symptoms for anorexia and bulimia when it comes to men. some of which including include obsession with working out, lying about eating, eating alone, weighing themselves a lot, too much focus on specific body parts, expressing disgust with themselves, and even when others tell them they look thin; they still feel fat (Glover 19). A 46 year old man had gender identity disorder. He had problems with the way his body was. He was afraid of gaining weight, he would make himself vomit, he felt very depressed, he took about 200 laxatives a week, and sometimes he took other herbal diuretics. He was also involved with bulimia websites for support. He felt like he did not have the best childhood. He did not get that much attention as a child. He had mentioned that his mom always wanted a girl and so he thought she might love him more if he was a girl. His father had died when he was just 15 years old. He did not want to go through with getting his gender changed to a female because he had strong religious views and did not think that was the right thing to do. He later became part of a program that helped people with anorexia nervosa and was later able to eat just fine, even though he was still too focused on his weight. He also began experiencing suicidal thoughts and was hurting himself a lot. He was released and struggled again on his own, put back into therapy, and then went to a gender identity clinic to change his gender (“Anorexia Nervosa and Gender...” 110-111). A 41 year old male, unlike the other male, had a very happy childhood. He was close with his family and his parents had cared about him a lot, even though he was bullied at school for being extra caring about others. He was later an anorexic and also had depression. He felt that the only thing that would fix his problems is if he were to change genders so that he would not suffer confusion anymore. He became a female and felt much more comfortable, even though he still has problems with anorexia nervosa. It is mentioned in this article that the first male’s problems were psychological, while the other male was biological (“Anorexia Nervosa and Gender...” 111-112). So in the end, yes, females suffer from serious cases of anorexia, bulimia, and other body disorder. The need to help those women is still out there, but everyone ought to pay more attention to the symptoms that men show which suggest they may be going through the same problems. Society should not be guiding people into stereotypes and approved lifestyles. Both men and women focus too much on their figures, when it should be character and physical health that matters to everyone. Eating right and exercising is important, but as shown through research, only to a certain extent. Getting carried away is unhealthy and life threatening.